Do you ever have one of those days when the only thing that will make you feel better is comfort food? Last week, I had one of those days. Comfort food differs for everyone. Macaroni and cheese, mashed potatoes, green bean casseroles, any casserole really…these are what most think of when they hear the phrase “comfort food.” However, I’m learning that the concept of comfort food changes for each person. While the foods I listed above are surely delicious, my idea of comfort food includes those types of dishes that are both nutritious and hearty at the same time. 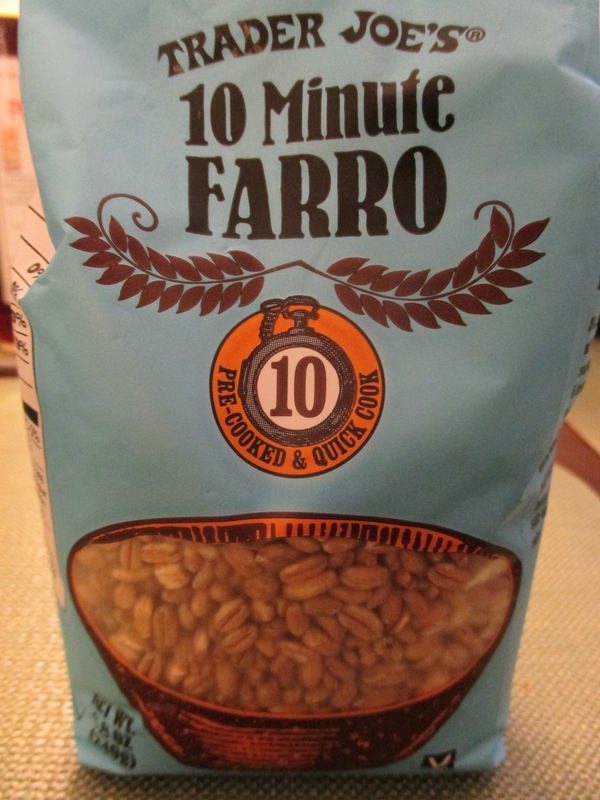 Have you heard of farro? Farro is an Italian grain that seems to form a happy medium between barley and wheat berry. When cooked, farro promises a chewy texture with a pronounced wheat flavor. My Dad and I first discovered farro when we watched Lidia Bastianich make farro salad on her PBS show Lidia’s Italy. We concocted this salad while on vacation in Cape Cod. Cooked farro with fresh mozzerella, fresh cherry tomatoes, basil, and an olive oil/red wine vinegar vinaigrette makes for a most refreshing picnic treat. Companies even make farro pasta these days, a healthy whole wheat pasta that does not taste like cardboard. “Alla Norma” is attached to any Italian recipe with eggplant as the star. My grandfather (I call him “Nonno”) told me that “Norma” is the name of an opera by Vincenzo Bellini. Who knew? 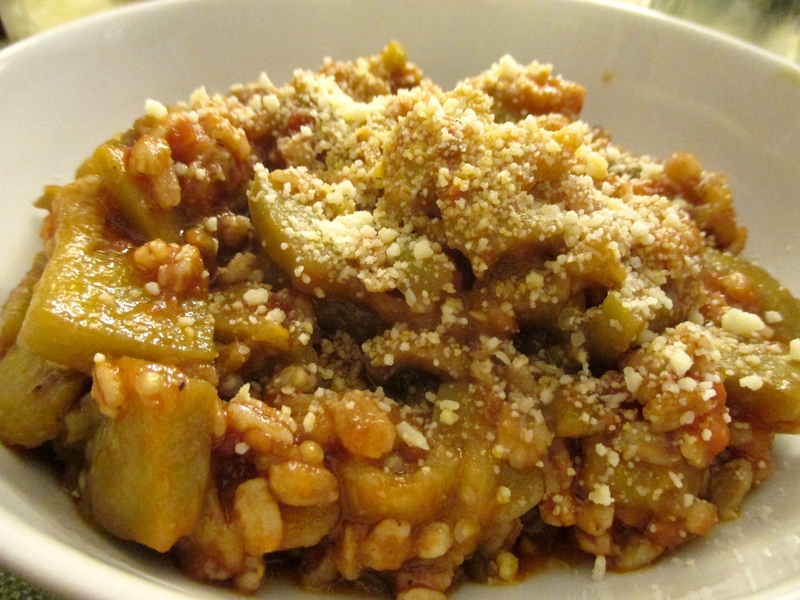 Farro alla Norma combines farro, roasted eggplant, and tomato sauce. Yum! Let’s get cooking. 1. Preheat your oven to 350 degrees. Wash your eggplant. Cut both ends off and peel the eggplant with a potato peeler. 2. Cut your eggplant into chunks. I made mine about a half inch thick and an inch wide. You can make your eggplant pieces as large or small as you please! Just know that smaller pieces take less time to roast, and larger pieces take more time to roast. 3. Take out a cookie sheet and line the cookie sheet with parchment paper. Parchment paper will be your lifesaver whenever roasting vegetables of any kind. When your vegetables are all roasted and pretty, you just throw the parchment paper away and you have a clean cookie sheet. Amazing! 4. Put your eggplant pieces on the cookie sheet with parchment paper. Pour a generous amount of olive oil onto your eggplant, enough for them to absorb some oil. Season your eggplant with salt, pepper, and garlic powder to taste. Mix your seasoned eggplant around with a spatula so all the oil and seasoning is incorporated. 5. Put your eggplant in the oven and let it roast for about 30-40 minutes. Check your eggplant after about 25 minutes to make sure you have enough oil on your eggplant. You want your eggplant to look more translucent (not completely), but you don’t want burned eggplant. 6. Take your eggplant out of the oven and let it cool. 8. After 10 minutes, or however long your brand of farro takes to cook per the product’s cooking instructions, drain your farro and put it back in the pot. 9. Add your desired amount of tomato sauce and the roasted eggplant to the farro in the pot. Stir it all together, letting the mixture warm up in the pot for a minute or two. There you have it! Serve this in a bowl with a generous helping of grated pecorino romano cheese, and you have yourself a hearty bowl of comfort food ready to make your day that much better. As always, comment with any questions, thoughts, or results you have with this recipe!